There are two letters about Ladywell Pool in this week’s Mercury, and both in response to a previous letter about the pool. One is mine, the same that was published the previous week in the South London Press, the other is instead by a woman mostly saying the opposite of what my letter says, and that is actually quite funny. I guess that many readers that don’t have experience of Ladywell Pool will be thinking “who’s right?”. The way Labour-run Lewisham has kept the centre for years is nothing short of scandalous. Still, the current manager is proactive. There is work to be done but the place is in a better shape than it has been for many years. Let me claim a share of the merit for the scrutiny that the Save Ladywell Pool Campaign has exercised. The pool itself has clean water and offers a swimming experience that’s superior to most modern pools, as a large number of regular users can testify. It is a public health issue. You only need to go to Ladywell to see what I mean. I also have some damning photos taken inside the ladies’ changing rooms recently (scum, more scum, faeces, clumps of hair etc). I am in full support of the Loampit Vale development. It will provide a decent public pool facility for everyone in Lewisham. I actually never understood the argument that because the changing rooms are dirty then you need to demolish a pool and build a new one. Do you blow up your house when it gets a bit messy? I suppose not, I guess you just get on and clean it. So why would a pool be any different? As I said in my letter the water of the pool itself is actually clean, the water treatment plant was refurbished at the cost of £150k during the 2002-04 refurbishment. The legionella bacteria found at the pool had instead formed in the pipeworks of the showers, which is a separate system from the pool itself and was old and had been badly patched up during the decades, but that has now been replaced too. The advice upon which the council based its sizing fails to accommodate the current users of Ladywell besides the thousands who will come and live around the new centre, not to mention that the impact of the transport interchange and the nearness of residents from the London Borough of Greenwich were also not taken into account. In short, the centre is not bigger than Ladywell but the population to accommodate is – and by a great number. As Ladywell Pool is currently working to capacity, then inevitably someone will be left out. As for the cleanliness of the changing rooms, for obvious reasons I have never been in the Ladies’ changing rooms, but I have complained about the males changing rooms in the past and I think that things have improved. I heard from many women about their plight and was asked many times to tell the manager about the issue, which I did more than once. Improvements have been done to the female changing room and there’s now a dedicated part time cleaner for the female changing rooms. He’d love to be notified by users if female changing rooms are in need of a clean. He can’t go in there, almost all personnel is male (this is an industry-wide problem) and if the female life-guards say that the changing rooms are dirty then they are sent to clean them and that’s not much of an incentive for them. I can’t find my notes of the meeting I had a few months ago with the current manager (who is a woman and can therefore visit the ladies’ changing rooms) but I raised the issue again and she told me of a £25k budget this year to spend on the female changing rooms and as I wrote in my letter to the press I think she’s doing a good job but of course I can only speak about the male changing rooms. There has always been a lot of discontent about the changing rooms, even from supporters of the pool, and especially women. I think that there are various issues at play here. One is the obvious argument that they are dirty at times and they need better cleaning. But besides that I think that there is also an issue of perception and expectations. The decor of the changing rooms is not great, they’re worn out 60’s changing rooms, basic but a bit grotty and even when just cleaned they don’t really shine. I’ve been to Downham Pool and I found the changing rooms quite dirty actually, obviously not cleaned carefully in the corners, and yet since it’s new and airy and bright it looks better than what it is. The other consideration is about what we should expect from public pools. When you shower chances are that between you and the last time the shower was scrubbed a few tens of people showered in the same place. I see the attendants cleaning quite often and doing a decent job too. But there are hair in the shower, and many users do leave a mess behind them, and it stays there until someone cleans it, and in the meantime you’ll stare at it. I too recently found a turd in the plate as I entered the toilet, it wasn’t mine but I flushed it. I could have taken a picture of it but somehow didn’t think about it. I remember it clearly not because I was particularly shocked by it but because I and other swimmers in the changing room mowned at length about people that don’t flush and fantasized about what we’d do to them (things you chat about at the pool). But there is also some responsibility of the Council, if the changing rooms were better looking then people would treat them better, that’s what always happens and it really wouldn’t cost a fortune to make them a nice and welcoming environment. To finish, Ladywel Pool is owned by the Council and managed by a contractor of their choosing, why would ever Loampit Vale Pool, again owned by the Council and managed by a contractor of their choosing, have cleaner changing facilities? Just look at Downham Pool, quite new and not particularly clean. Recently posters inviting people to shower before swimming have appeared in the changing rooms, I’d make that compulsory actually, to avoid the hair in the shower you just need to wear slippers, to avoid what people bring with them inside the pool you need a bodysuit, and that’s not really practical. 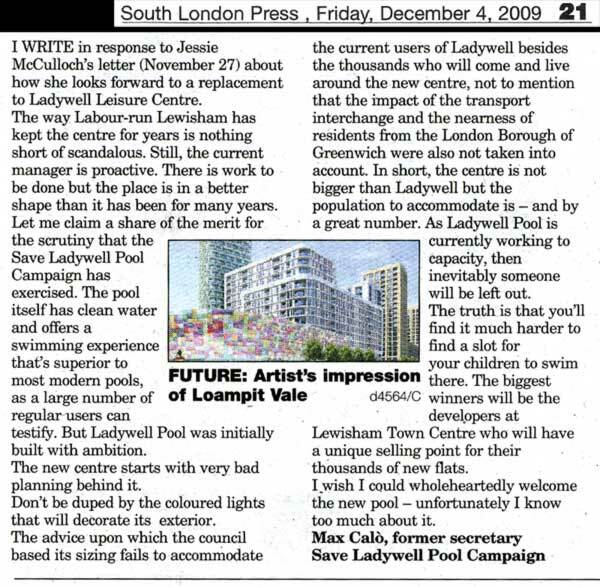 On Friday the South London Press published this letter of mine about the new pool at Loampit Vale. Everytime I asked at Council why the specifications of the “state of the art” new swimming pool planned for Loampit Vale are so poor and made specific reference to the very low depth that would never allow diving again in this Borough I was always told that hopeful divers are very well provided in South London and that there’s no demand for more diving facilities. The South London Press now shows us what these wonderful facilities that our Labour Councillors were speaking about look like. Kids in a freezing room jumping on mattresses pretending they’re in a swimming pool! Of course when the Olympics were presented the opening video opened with some great divers, good for presentation purposes, not good enough to support for real.